The Importance of Purchasing the Ideal Forklift: Which Type Will Best Suit Your Warehouse’s Needs? In most warehouses, the Forklift is the most highly customizable piece of machinery around. 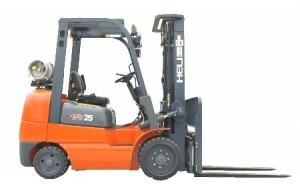 So, when you purchase a Forklift, know that you are purchasing one of the most important investments for your business. Thankfully, Anderson Forklift stocks numerous types and sizes of Forklifts, because no two businesses are built exactly alike; everyone has different needs. One of the most important considerations to Forklift size is the width of a warehouse’s aisles. Some warehouse spaces can only accommodate a certain size of machine. If your Forklift is going to operate in a yard, it’s the same: How much yard space does your Forklift need to operate? Inside, how tall are your warehouse ceilings? How high will the Forklift be required to reach to secure a load? Are there other employees who need to use the aisle space to work? These are important questions that you should know the answers to before you decide on the best model/type of Forklift for your business. Which type of fuel will work best in your warehouse environment? If you purchase an indoor model, the Forklift will operate on batteries—and those batteries will need to charge, daily. (It goes without saying that outdoor models, the models that run on fossil fuels, are producers of carbon monoxide and are dangerous choices for indoor-only environments). And the Most important consideration is to remember to visit Anderson Forklift when you decide that a new or used (Remember that Anderson Forklift carries a wide variety of quality, serviced, used machines) Forklift is in your business’s best interest. Call or stop in to speak with the experienced Forklift specialists at Anderson Forklift.